Putuoshan hotels: discount reservation system offered by chinahotelsreservation. Putuoshan reservation: your demands regarding your stay, included detailed instructions about tours and convenient solutions for hotels and rooms arrangement. For detailed Putuoshan hotel information or to reserve a hotel please click on Putuoshan Hotels list. The mountain of Putuo lies to the east of gulf of Hangzhou of Zhejiang Province about 100 sea miles, is an island in the Zhoushan Island. The area of the whole island is 12.5 sq. km., narrow and long in shape,It is 4.3 kilometers the most in the north and south, east and west are widest 3.5 kilometers outside. The highest point is Foding mountain, about 300 meters above the sea level. 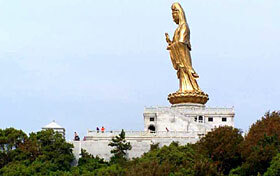 The mountain of Putuo is one of the mountains of our country's four Big Buddhism's Christian name, is the famous island scenery tourist attraction at the same time . Because sound Bodhisattva " belongs to water " view generation, so called " the South China Sea Buddha country ". It is the travel Holy Land of Buddhism of our country. The mountain climate in Putuo is moist, the scene is moved at any time, cool in summer and warm in winter, the grass and trees are green for a long time. 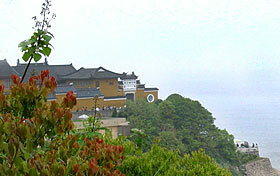 Putuo mountain famous scenic spot as follows, the pavilion of Chaoyang, tea and mountain, unwilling to go to institute of Goddess of Mercy, listen to the tide stone , the stone of the heart word , Buddhist sound hole, the forest of the black bamboo, the hole of Chaoyang, tide sound hole, short aunt has a head, many pagodas, two tortoises listen to the law stone, the hole of China of France, the rain temple of the law, hole of Goddess of Mercy, only bright peak, sea print pool is intelligent to help in the temple, the Nine-Dragon Wall, the lotus flower ocean, Lip river Jia mountain island, Mei Zhyuan, Goddess of Mercy in the South China Sea, South-Sky Gate, huge rock top stone, help the temple generally.